Danny Byrne from the CWI introduced the session on New Workers’ Parties, Left Populism and the CWI, including the ideas and programme of SYRIZA and Podemos. Danny made the point that the CWI had been the first and, for a period, the only political trend on the left in the 1990s to work out the perspective that new left formations would arise in the period following the collapse of Stalinism. This perspective flowed from the crisis in political leadership and organisation of the working class which saw many of the working class’ mass political points of reference change sides, moving rapidly to the right. The CWI was also alone in raising the “dual task” of building a revolutionary party while struggling for new mass working class parties to hasten the development of socialist consciousness and the class struggle. The “traditional” organisations, for example New Labour in Britain and the Social Democrats (SPD) in Germany, under pressure from the ideological effects of the collapse of Stalinism, moved fundamentally to the right accepting the dictatorship of the market and neo liberalism. In effect they were emptied of their mass base in the working class: first in membership, and over time electorally. In effect, they became “bourgeosified”. This left huge vacuums in politics that has also allowed for the development of populist right and far right forces as well as new forces on the left. This vacuum can be filled by varied forces, factors and figures. In Greece, SYRIZA emerged as a coalition around the ‘euro-communist’ Sinaspismos, initially a split from the Communist Party. The Left Party (DIE LINKE) in Germany was a result of a group breaking from the SPD and fusing with the ex-Stalinist party of East Germany (PDS). New formations that have a radical populist character have also emerged around media figures and academics, like Podemos in Spain, led by Pablo Iglesias and a circle of academics who tapped into the mood following the ‘Indignados’ movement. At this stage, despite a few electoral successes, none of these formations have filled out to become a “new mass workers party”. This is partly in some cases because of their early stage of development, and to a certain “anti-party” mood in some cases. However, it has mainly been due to the political and organisational weaknesses from the outset of these formations which can prevent masses of workers and youth joining in as activists and having a political impact. This can also mean that these formations can be unstable and short lived, entering into crisis once they are seriously tested by struggles and events. The leadership of many of these formations base themselves on an anti-austerity rhetoric, but have no concrete perspective or programme to implement anti-austerity policies. They believe that an end to austerity can be negotiated with capitalist institutions, even within austerity institutions like the Eurozone. This has been seen with the position of the SYRIZA leadership since they came to power in January. This has resulted in an eventual capitulation once economic terror from these institutions was applied and despite the heroic resistance in the July “Oxi” referendum by the Greek working class. The SYRIZA leadership never prepared for or seriously considered a repudiation of the debt and an exit from the Eurozone on the basis of socialist policies – public democratic ownership of the banks and capital controls, with a state monopoly on foreign trade, for example. They were prepared to stay in the Eurozone even if it meant a third memorandum of horrific austerity. Rather than having faith in the capacity of the working class to struggle reflected in the colossal 61% Oxi vote of Greek workers and youth and the huge support such a rupture would have generated from workers and youth across Europe, Tsipras and the SYRIZA leadership capitulated. Having failed the test of real struggle, SYRIZA now faces a likely split and is discredited amongst the most politically conscious Greek workers. There is a vital need for a new left formation to stand on real socialist policies committed to challenging austerity and capitalism in Greece. The volatility of new formations – which can rise and fall equally explosively based on events and political mistakes – featured throughout the discussion. Even very new formations that can quickly arise and accumulate massive electoral support can be tested and begin to be undermined before getting into a position of power. Podemos, for example, emerged from around a movement where the idea of “parties” in the traditional sense was attacked and rejected. Despite Podemos now being a force that stands in elections and claims to want governmental power in still reflects some of these “anti-party” ideas, and bases itself on rhetoric about deciding “from below”, rather than through party structures. Unfortunately as explained by Danny and Viki from Socialismo Revolucionario (CWI in Spain) this has resulted in an undemocratic top down approach in reality based on an unaccountable leadership elected in online referenda, and very limited democratic discussion in local Podemos organisations. Things are decided rather than using methods of mass democratic debate and discussion in active meetings of workers and youth, in online votes or directly by the leading circle around Pablo Iglesias. This also flows into Podemos’ political programme and outlook. Pablo Igelisias and the Podemos leadership group are influenced by the ideas of “post Marxist” political theorist Ernesto Laclau. Laclau rejects the idea of a political programme that shows the way forward for the working class in confronting capitalism and takes up their aspirations. Instead, he puts forward the idea of general concepts or “empty signifiers” being raised that the “people” can then rally around. The content of concepts should only be defined in a vague manner and be designed to gain “transversal” support, fleeing from class antagonisms. For example in its early days, Podemo’s rallied against “La Casta”, a corrupt elite. They rejected the idea of class society that the ruling class constitute an elite because of the economic structure of capitalism and instead, emphasised the question of political corruption. This post-modernist approach has fallen short when Podemos became a major player in politics. Large sections of the population want to know its position on the debt to the Troika and the question of the Euro and what it would concretely do to confront austerity in power. This has meant Podemos has begun to lose support to the right. Ciudadanos (Citizens) has emerged as a national force, which bases itself on similar rhetoric about transparency and a renewal of democracy but linked to a right-wing programme. Podemos’ potential has seemingly been exceeded by the emergence of the “popular unity lists” in local elections in May, which involved activists from Podemos, United Left (IU) and beyond s well as unaligned workers and youth which won the Mayor’s position in Madrid and Barcelona on an anti-austerity message. There is mounting pressure for a repetition of such lists on a state-wide level towards the general elections. Sascha from SAV (CWI in Germany) came into the discussion to highlight the experience of working in Die Linke, in which SAV participates. Die Linke is a significant organisation, a certain reference point for workers and an obstacle which the capitalist class have to be mindful of when implementing their agenda. However at various point its support has been undermined by participation in regional and local governments with the SPD and carrying out austerity. This and the lack of a clear socialist policy to deal with the Eurozone crisis has prevented Die Linke so far from becoming a mass force actively participated in by the working class. There is a possibility of left and right splits in Die Linke in the future under the pressure of events. Felipe from Brazil talked about the potential of PSOL (Party of Socialism and Liberty), a left formation in which LSR (CWI in Brazil) participates. Where left forces like the CWI are prominent in PSOL election campaigns, PSOL increases its support. However, since its inception PSOL has come under pressure to take a softer approach and enter into coalition with forces like the Greens and even the PT. PSOL has become more of a reference point since the mass movements in Brazil around the world cup and the next period will be decisive in its development. Matt from Scotland explained the post-independence referendum surge for the Scottish National Party with the party’s membership rising to over 100,000 and electoral success in the May 2015 general election. It reduced Labour to one MP and won 56 seats. In a distorted way, this further confirms the perspective of working class people looking for a political alternative and the potential for a new mass workers’ party. The petit bourgeois nationalist SNP, in a populist fashion, are posing as anti-austerity. The 2014 referendum became a revolt against austerity with Labour siding with the Tories and majority of big business in the anti-independence campaign, the SNP were seen as being under attack from the political establishment and benefited. In reality, while calling for an increase in public spending, the SNP have implemented every penny of Tory austerity through the Scottish parliament and local councils which they control. They have also implemented policies of pay restraint in the public sector, privatisation in transport and support tax cuts for big business. There was an opportunity in the immediate period after the referendum, if a clear call had been made by a high profile figure on the left like Tommy Sheridan for a new party. Tommy spoke alongside socialists including Socialist Party Scotland (CWI) to tens of thousands during the referendum at dozens of meetings. Socialist Party Scotland gave a socialist case for independence at these meetings. A new party or formation with socialist policies, could create a significant force to the left of the SNP. Socialist Party Scotland publicly called for this but Tommy mistakenly called for vote for the SNP in the general election. The space to the left of the SNP will, over time grow substantially as they are exposed. They will refuse to use their anti-austerity mandate and defy austerity by setting a no cuts. Socialist Party Scotland is striving to build a 100% anti austerity alternative as a step to a new mass workers party and was to the fore of the Trade Unionist and Socialist Coalition (TUSC) electoral challenge in May 2015. Other sections of the left, including the remnants of the Scottish Socialist Party (SSP), are unclear on calling for opposition to the SNP implementing austerity and are retreating from putting forward clear socialist policies using the weaknesses of SYRIZA and Podemos as a model. Marco from Controcorrente (CWI in Italy) highlighted that the PRC (Communist Party of Refoundation), a large new formation during the 1990s and early 2000s with over 100,000 members and an impressive electoral base and trade union influence was fatally undermined by going into coalition with pro austerity parties. Its leaders also diluted socialist ideas in favour of postmodern ideas coming out of the anti-globalisation movement. The legacy of the collapse of the PRC is a huge political vacuum in Italy with working class struggle affected by the lack of a political vehicle. The consequence is the rapid rise of populist formations like the 5 Star movement founded by celebrity Beppe Grillo. Grillo and the Five Star movement have at times put forward left policies like nationalising the banks but have also implemented cuts when gaining power at a local and regional level and is ridden with internal division and splits. Now, many workers look to the metal workers’ union, FIOM, to be catalyst for working class political representation. The leadership of the union have raised the idea of a political formation but not in a clear way and have called for a social movement rather than a party. The PRC was one example of left formations that have initially shown a lot of potential in terms of electoral support but have been short-lived because of the political mistakes of their leaderships, often coalitionism with pro capitalist parties out of a reformist perspective. Its fortunes constitute an important warning for current and future left formations. 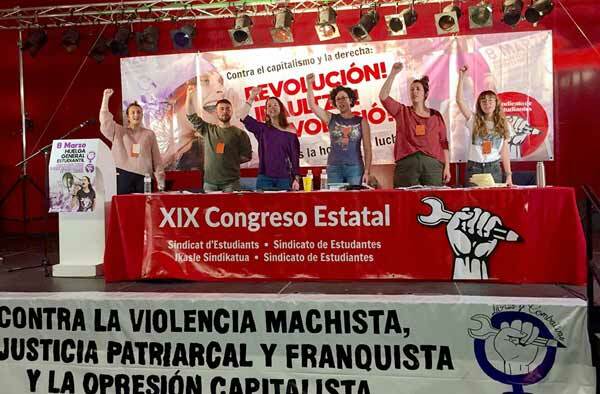 Formations like the New Anti-capitalist Party (NPA) and Left Front (Front de Gauche) in France, were touched upon by Leila from Gauche Revolutionnaire (CWI in France). Leading figures like Olivier Bescancenaut and Lean-Luc Menchelon have largely wasted their potential. In 2002, the parties to the left of the Communist Party (including the LCR and LO) received almost 3 million votes (10%) in Presidential elections, but squandered the opportunity. Sectarian infighting and the lack of a clear programme for the crisis has allowed forces like the Front National to benefit. Niall Mulholland from the CWI’s International Secretariat replied to the discussion. In the coming period as struggle develops we will see the emergence of new mass workers parties or their outline in new left formations and splits from the old workers parties. The desire from young people and workers for political representation and organisation will be seen and expressed in many ways. This includes surges of electoral support for existing opposition parties like the recent surge for the NDP in Canada. We are also witnessing the dramatic rise of the Labour leadership campaign of Jeremy Corbyn in Britain when left social democratic ideas are put forward. This development, in reality an incipient split from New Labour whatever form it may take, is another reflection of the tendency towards a new Left alternative being built. Niall pointed out some of the contradictory features of new formations, shifts to the right and left. Old organisations like the ex-Maoist Dutch Socialist Party and the Workers Party in Belgium can gain in electoral support and even in membership albeit this can be of a passive character as these formations do not provide clear political leadership against austerity or have sufficiently open and democratic structures. Sometimes these formations do not clearly break with mistaken methods of the past and this can be a check on their levels of support. In Turkey, a rise in the vote for the left HDP (linked to the Kurdish movement and PKK) party has been seen but it is still viewed with scepticism by Turkish workers due to its PKK origins. What is vital is that a Marxist spine can make a fundamental difference in Left formations and future workers’ parties, as seen in Ireland with the role the Socialist Party is playing in the Anti Austerity Alliance.